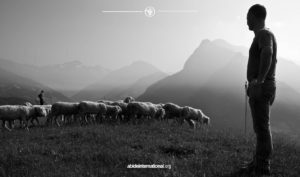 The voice of Jesus, the good Shepherd, inspires rest, satisfaction and purpose in the sheep. His voice liberates the sheep to live their purpose. Sheep are a one voice community. More than one voice gets them nowhere. Sheep are useful for good purposes only. They are a useless as a tool for evil purposes. A Shepherd leads His sheep on the path of their good purpose and true usefulness to others. They are lost on any other path. The Shepherd lays down His life to protect the sheep so they can fulfill their purpose. Sheep as a species were not created to react in their own defense. They need a shepherd to protect them, unify them, lead them to rest and satisfaction. Only a shepherd can show them the way to be what they were created to be. Sheep are at their best when the act in unity with the Shepherd and each other to be useful to others. A sheep is a living sacrifice which is acceptable to God, A sheep is Abel’s offering of a life laid down for others. Cain’s offering was rejected because it was filled with self-pity and angry reaction. So unlike a sheep. Sheep are a living action for the good of others. Are we? If we are, all credit goes to Jesus.